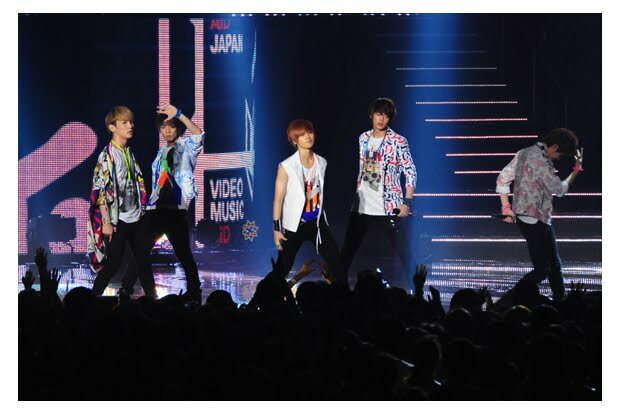 SHINee performed live at the MTV VMAJ yesterday, showing off their talents of singing, dancing and their fashion. After their Japan debut on 22 June, this is the second time that they've performed live in Japan, first in Happy Music and now in MTV VMAJ. They performed their debut song, "Noona you're so pretty" in Japanese, which was their Japanese debut song, "君は僕のeverything" and received lots of attention. SHINee, who received loud screams even during their stand-by, were all in black skinny jeans. Wearing colorful tops, they performed “Replay – you are my everything,” their Japanese debut single released recently. It is a song not showy, but warm and deeply touching. 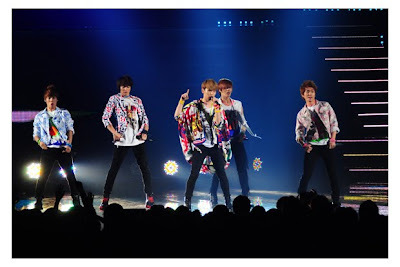 Taemin and Key sometimes stared at the audience with smiles on their faces, and Minho and Onew expressed feelings of the song with rhythmical steps. A strong vocalist Jonghyun’s ending part adlib was overwhelming! Each of the five members emitted his own charms to the maximum and left a strong impression of “SHINee as a new trend” on the audience. 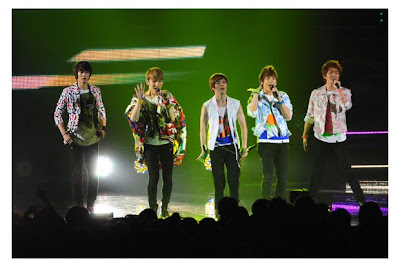 When they bowed low and walked out waving hands after finishing their stage, big roars filled the stadium for the five members. Are you excited for more SHINee performances?